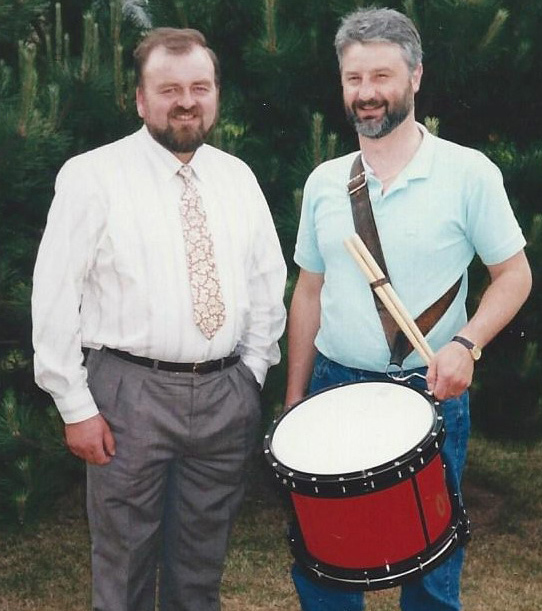 ‘Andante Percussion’ was formally established by Sam and Frank Hodgen in November 1986. 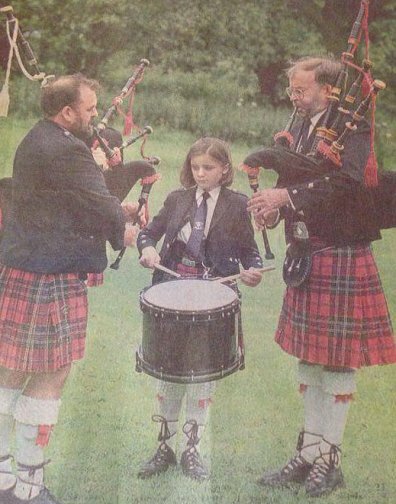 Sam and Frank were both experienced band players with over 80 years’ collective experience as musicians. 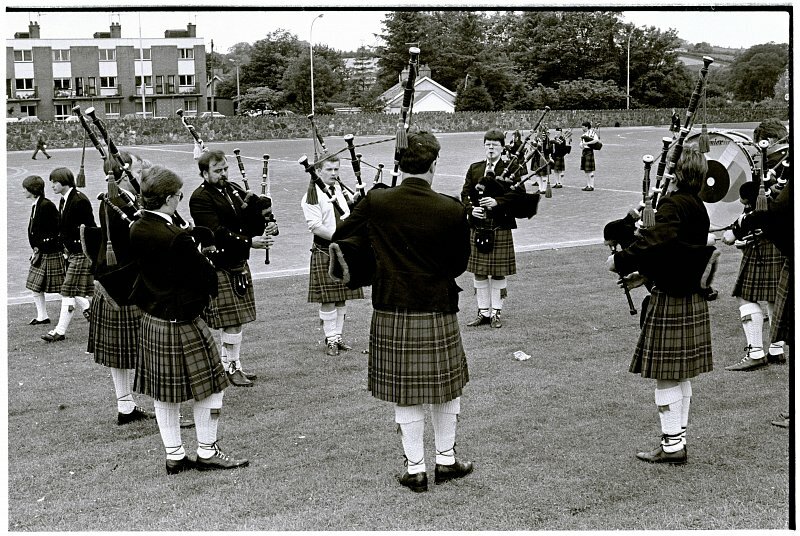 The inspiration for the business came about when the pipe band with which Sam and Frank were playing in at the time, were experiencing technical problems with their drums. 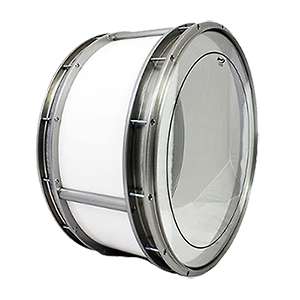 The structure of the drums, being used, were not sufficiently strong to adapt to the new woven ‘Kevlar Top’ playing head. 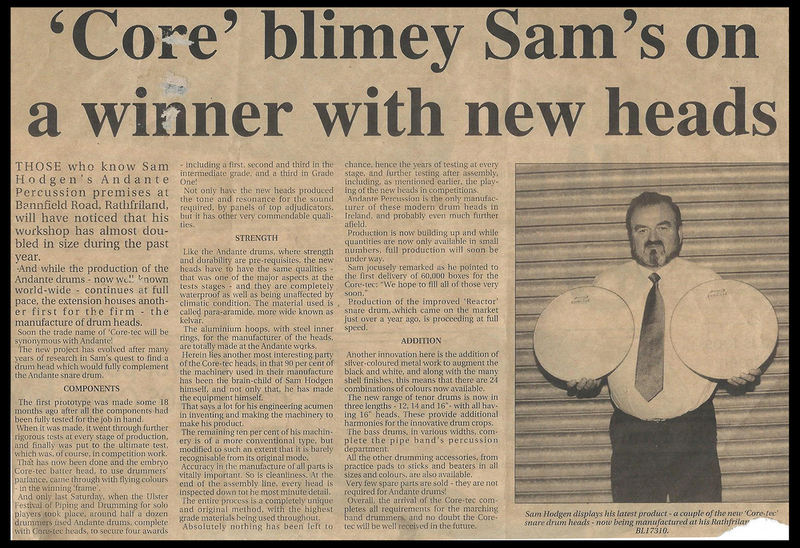 Sam sought to search the market for a better performing alternative, however was unable to acquire a product which was an improvement over what the band was already working with. 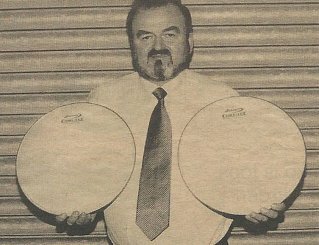 It was at this point where the idea of designing and producing a world class drum product was conceived in Rathfriland, Co.Down. 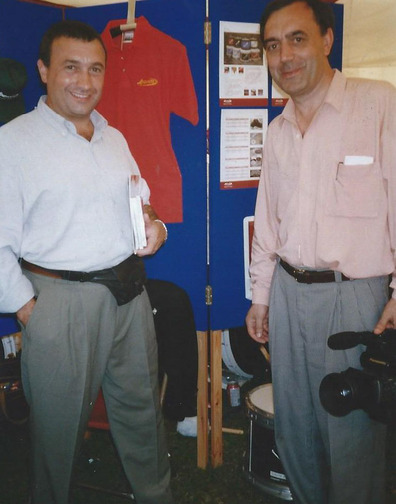 30 years on, the business is now in the process of extending its products, factory and workforce in a bid to meet growing demand. 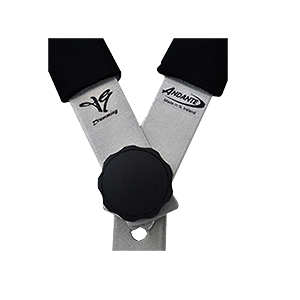 The custom finish (provided by Andante) sets the brand apart from its rivals, and provides customers with an opportunity to tailor the product to suit their bespoke specification. 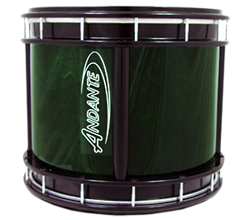 Andante intend to continuously explore and advance the technology and design of Percussion Instruments for Marching Bands across the world. 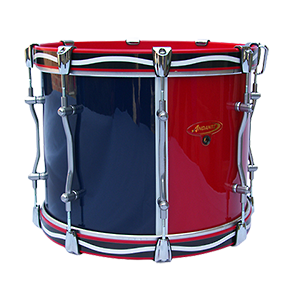 Andante products are now being used by well renowned Marching Bands and Solo Drummers worldwide. 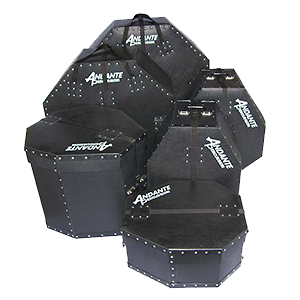 The profile of Andante’s customers is testament to the unrivalled quality of the product. 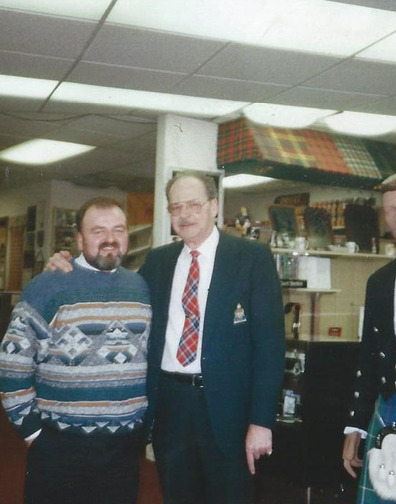 Andante is proud to be a family owned market leading business. 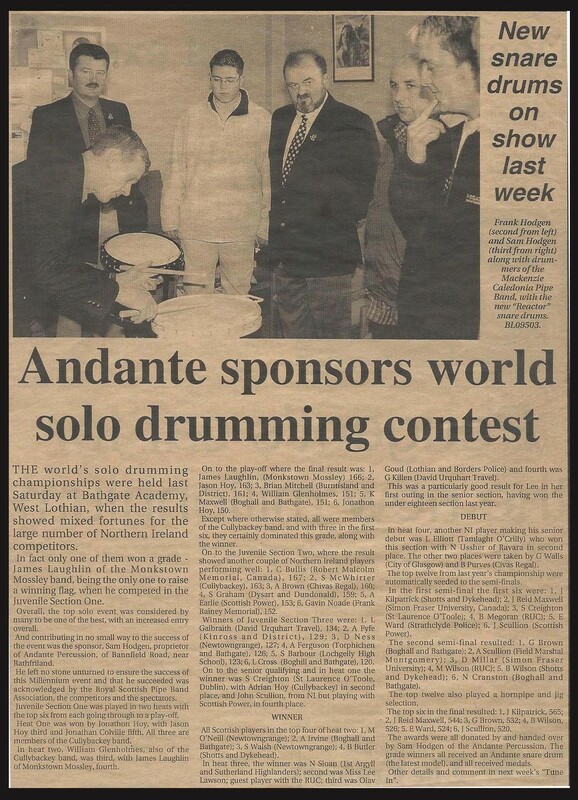 At the World Solo's in 1986, Andantes Prototype Snare Drum was seen for the very first time. 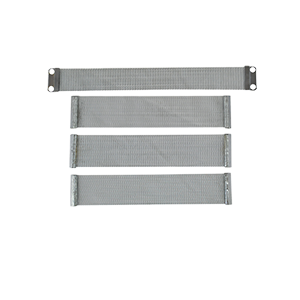 Sam managed to spark alot of interest in the product and started to make a name for Andante by securing 2 orders. 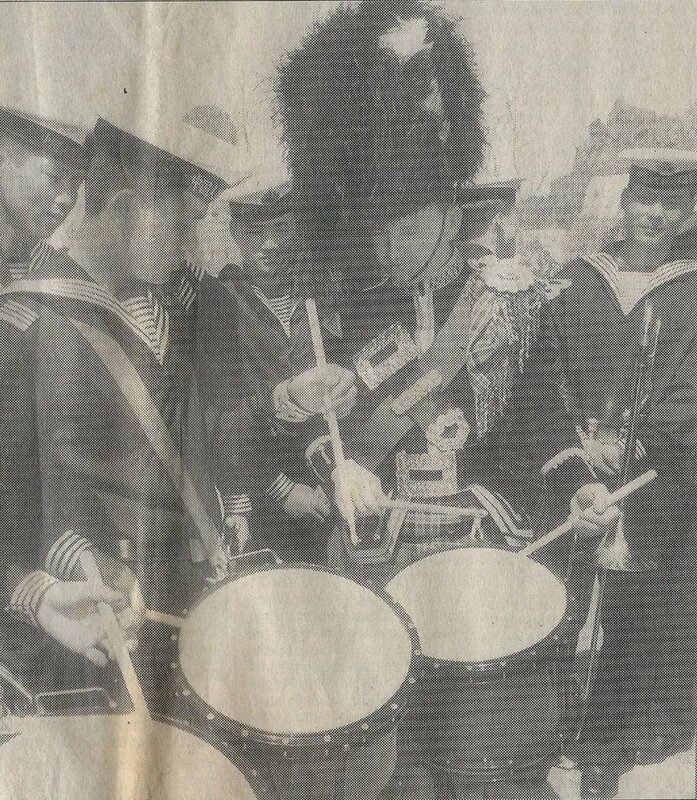 This then lead into more research and development and the launch of the SPA 30 in 1987. 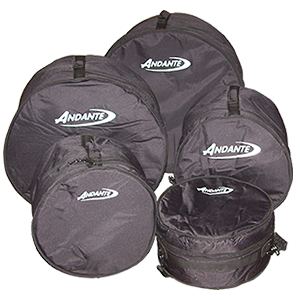 1988-1989- Seen the development and expansion to the Andante Range with the introduction of the Original Series Bass and Tenors. 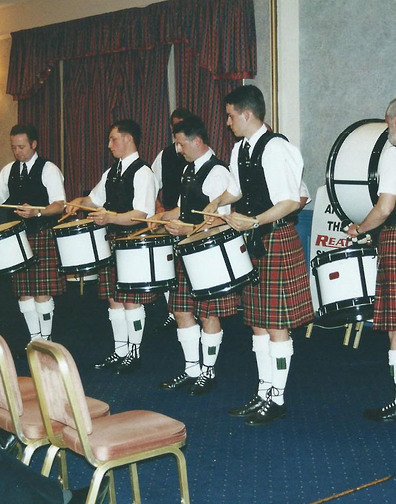 1991- More research and development on the Snare Drum which lead to the launch of the DTS 4 later that year. 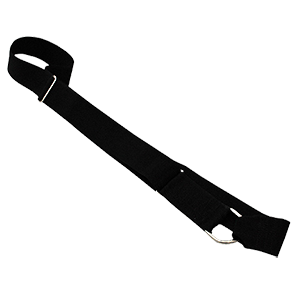 1993-1994- Seen development to the accessory range with a Bass Harness, Slings, Bass and Tenor Sticks, a Practice Pad and Cases. 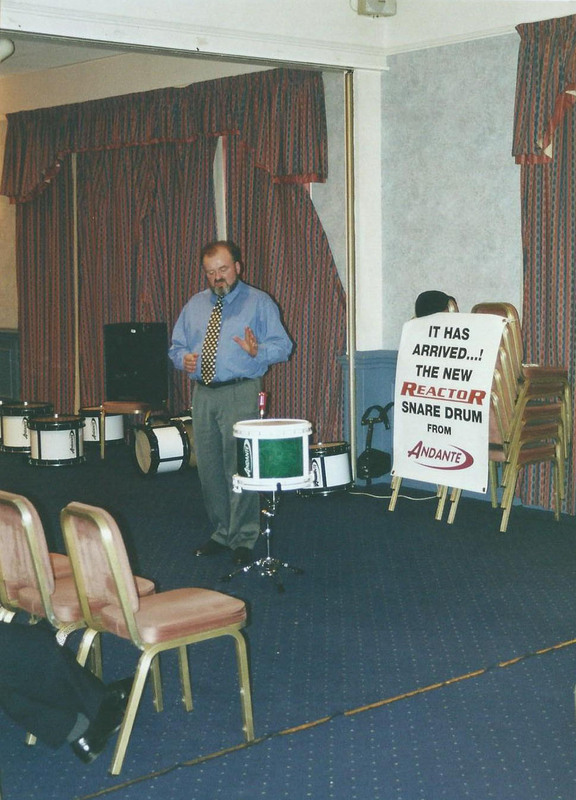 1995- More research and development on the Snare Drum continued and towards the end of 95 the DTS 6s was on the market. 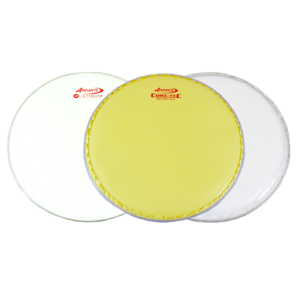 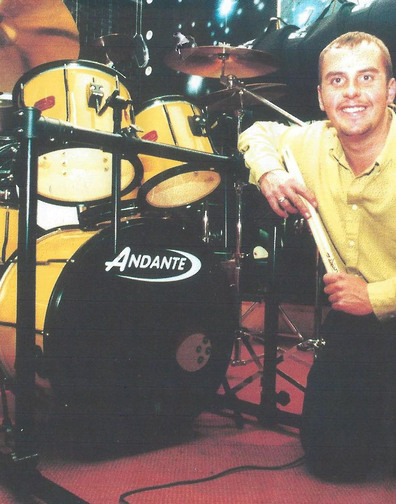 1996- Andante launch several new products; including Drumsticks, an extended range of Bass Drums for Marching Bands and the development of the Andante Drumkit. 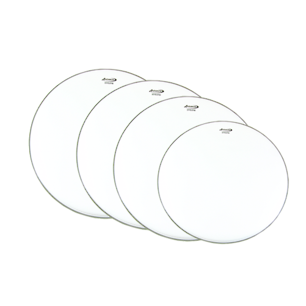 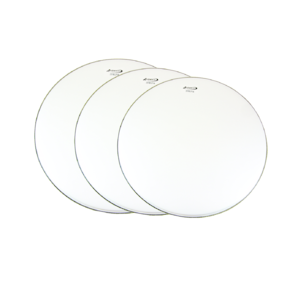 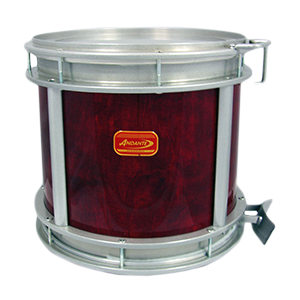 1986-1995- Andante develop a series of new Snare Drums (including the DTS6s), Bass and Tenor Ranges. 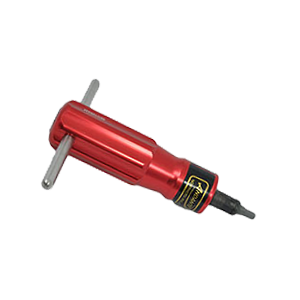 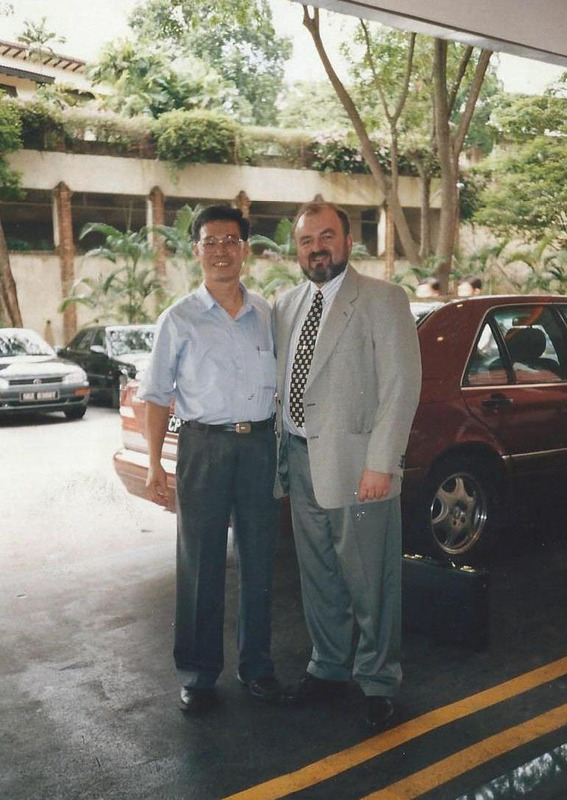 1997-1999- Andante maintain continuous development of the full range of company products. 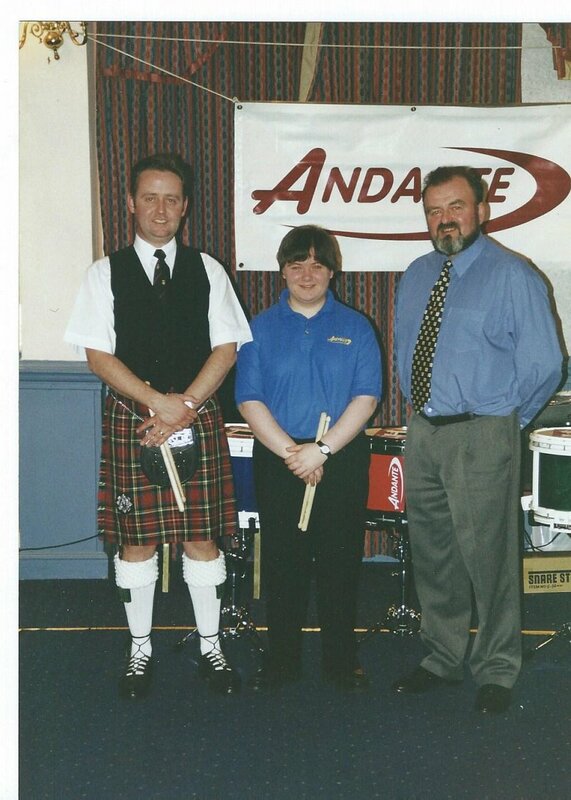 1999- Was a momentous year in the Andante Calender, as this saw the company achieve one of it's ambitions, by sponsoring the prestigious 'World Solo Drumming Championships' held in Bathgate, Scotland and is still being sponsored by Andante today. 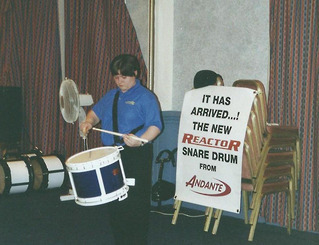 2000- Andante develop and manufacture the Reactor Snare Drum. 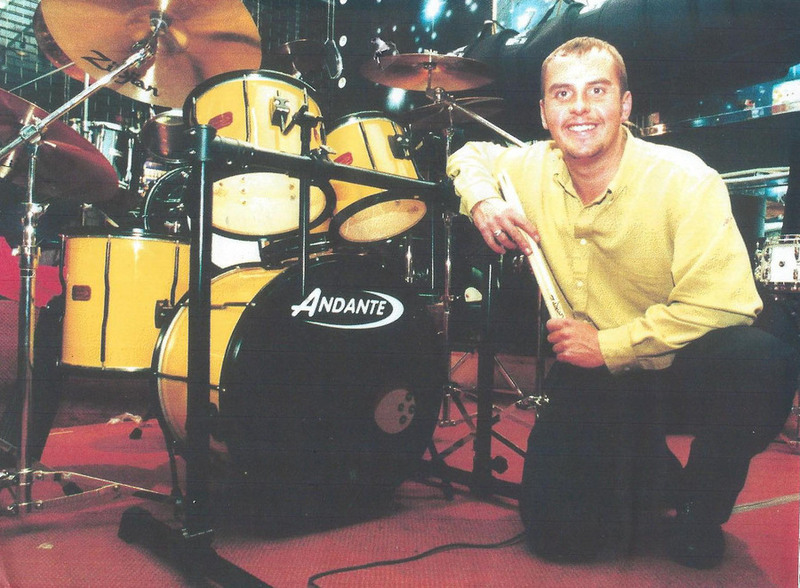 2002- This year signalled another period for expansion at Andante, with the construction of a new building to facilitate the development and manufacture of the Core-tec Head. 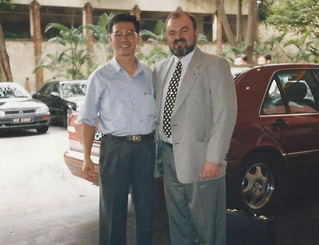 2003-2004- The company develops research techniques to improve its products. 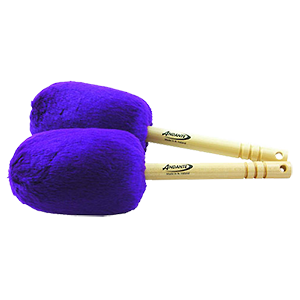 In addition, the company advances colour ranges and the manufacturing of the TG Drumming products. 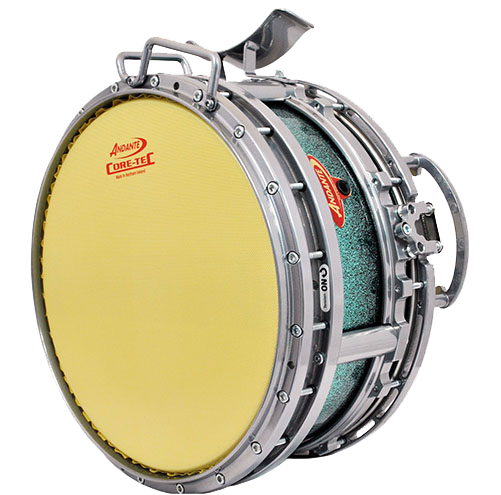 2005-2008- Andante develop the 7” Snare Drum, and the extended range of Tenor Drums. 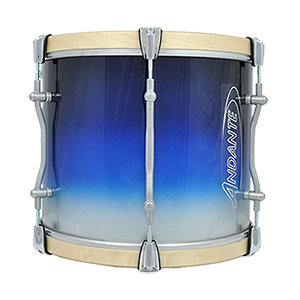 The company also invest in the purchase of manufacturing equipment for the Andante Snare Drumstick, and the development of the custom range Snare drumstick. 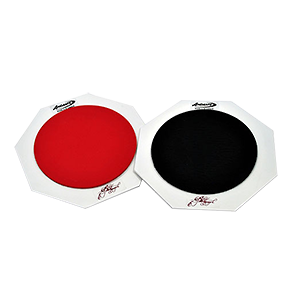 In addition, the company adds bespoke soft-cases to its case range, along with new practice pads and hand towels to the Andante accessory range. 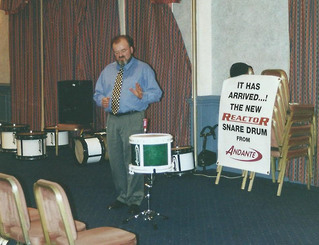 2008- 2009- Sam Hodgen begins further development of the Andante range, through exploring new products and innovations. 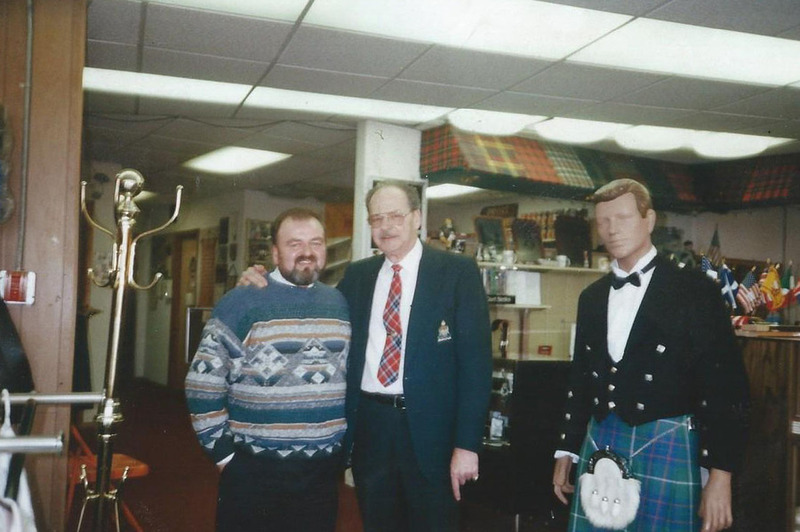 Unfortunately Sam (Andante founder) was not able to see these products through, as he passed away on the 4th February 2009. 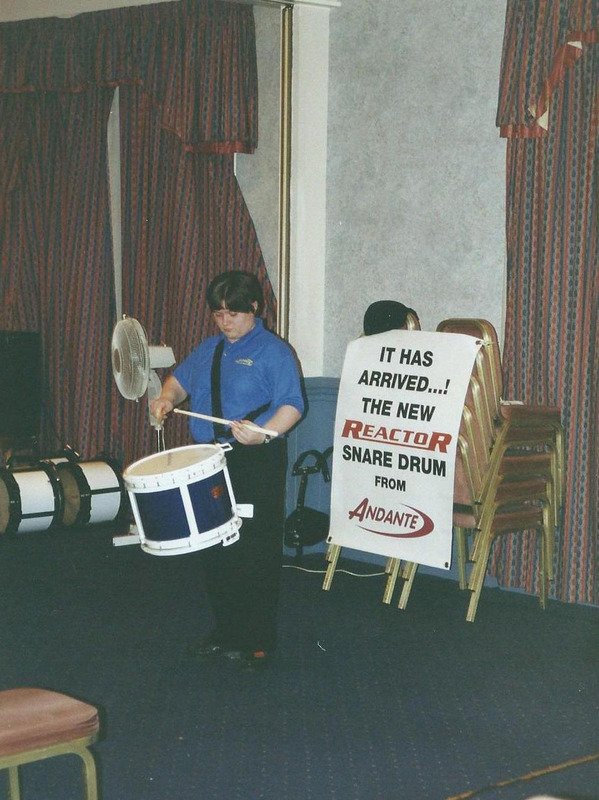 Sam’s engineering influence can be seen through the design of many of the latest Andante ‘Next Generation’ products. 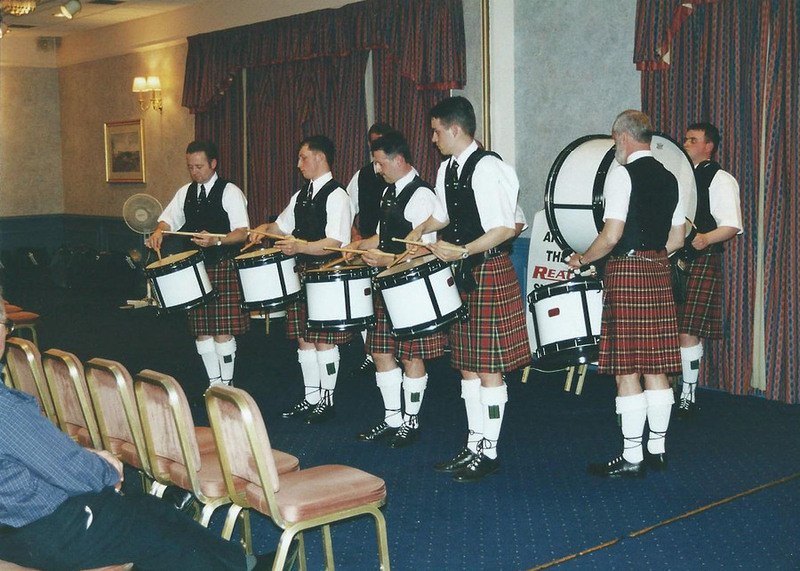 2009- This year signalled a new era for the company as it continues the research and development of the new ‘Andante Advance Military series’ drum. 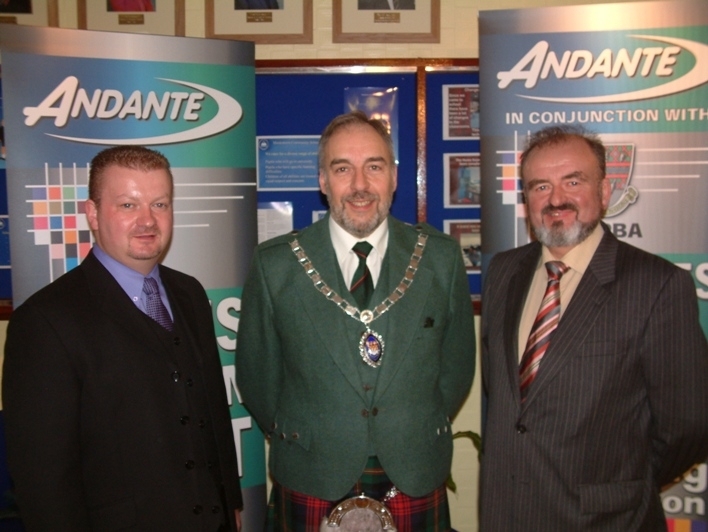 2010- This year saw the launch of the ‘Andante Advance Military series’. 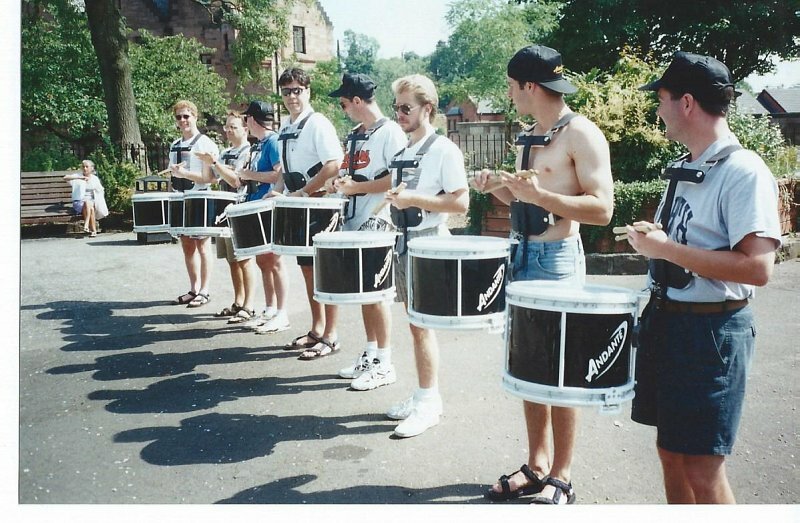 Furthermore, during this year the research and development of the ‘Pro Bass’ and ‘Tenors’ began to take shape. 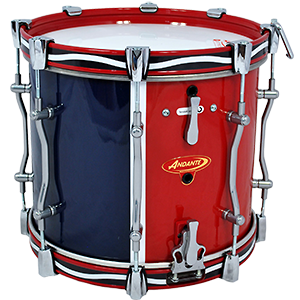 2011- Andante complete research and launch the new ‘Pro Bass & Pro Tenor series’ drums. 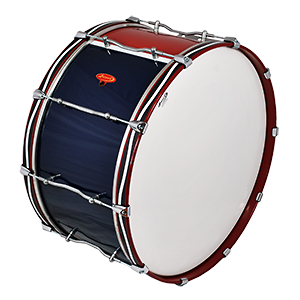 Towards the end of this year, further research and development got underway to update the stick range and Snare Drum range. 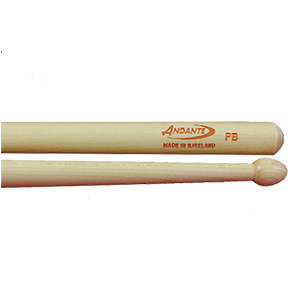 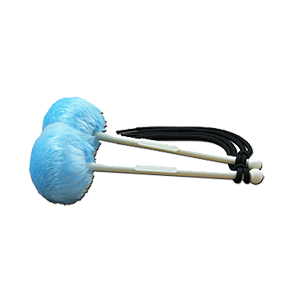 2012- In March 2012 Andante introduce the ‘Quantum Tenor Drumstick’ to the accessory range. 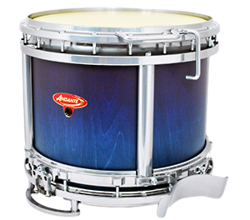 2012- In May 2012 Andante launch the ‘Next Generation Reactor Snare Drum’ and add a ‘Ghost Chrome finish’ to the Custom metalwork range. 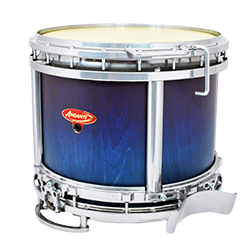 2014- Andante develop and manufacture 15” and 20” sizes to extend the ‘Pro Tenor Series’ Range. 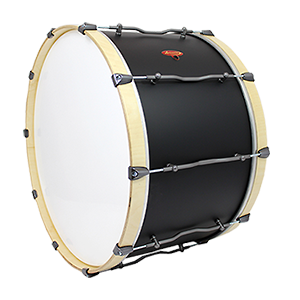 The company also add a new Black Chrome design to its custom metalwork finishes. 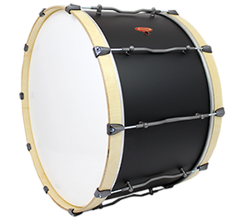 2015- This year saw further developments to the ‘Pro Bass Series’ with the introduction of the 24” and 26”size range. 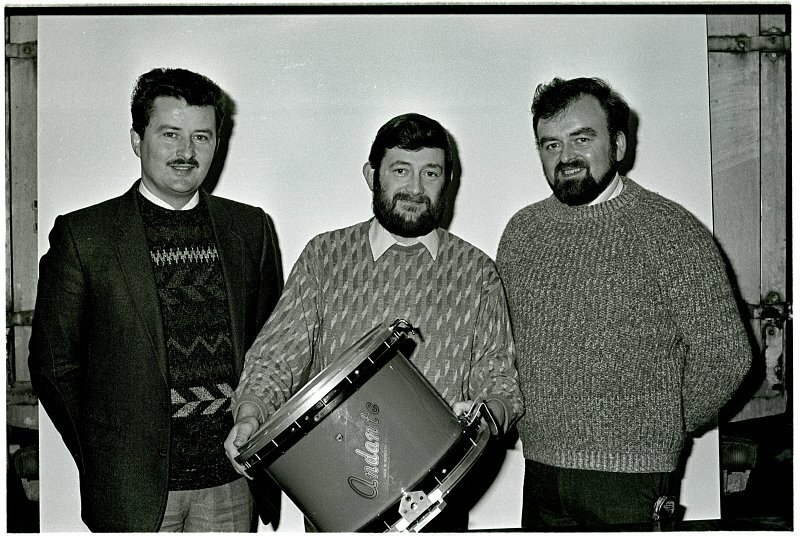 Sam Hodgen pictured with his brother Frank ( Founders of Andante Percussion) and good friend Frank Gibson with the first Andante Snare Drum. 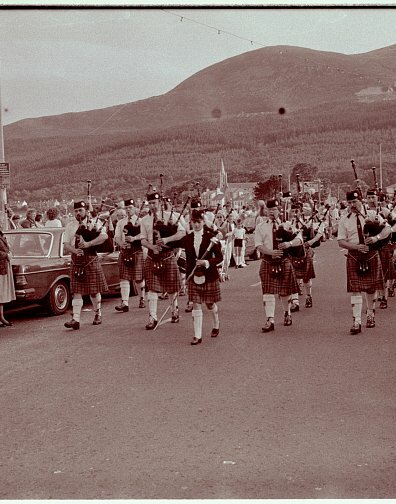 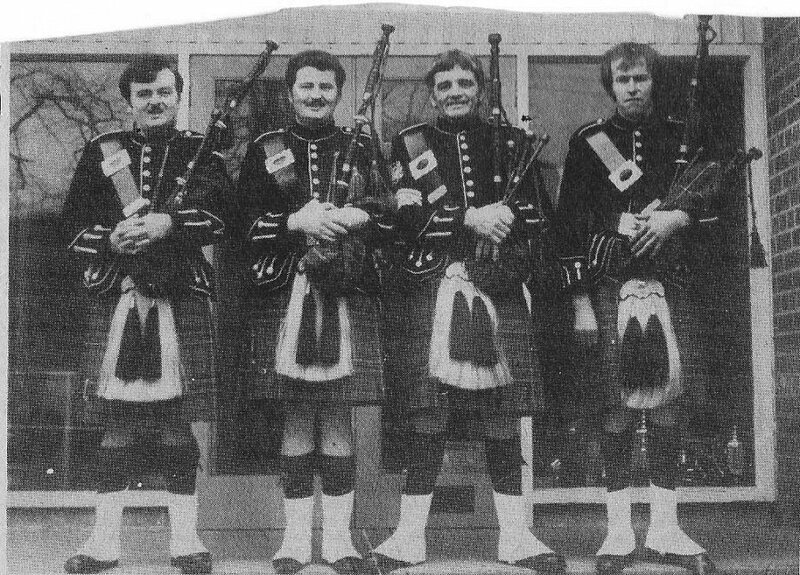 Moneygore Pipe Band in the early 80's, Pipe Major Sam Hodgen third in from left with son Nigel Hodgen playing beside him. 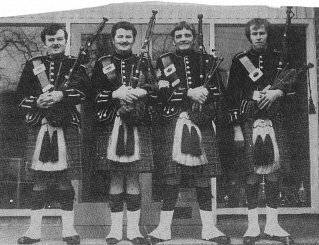 Sam's brother Frank, nephews Edmond & Adrian all played in Moneygore Pipe Band and both Nigel & Adrian Hodgen are still in the business today. 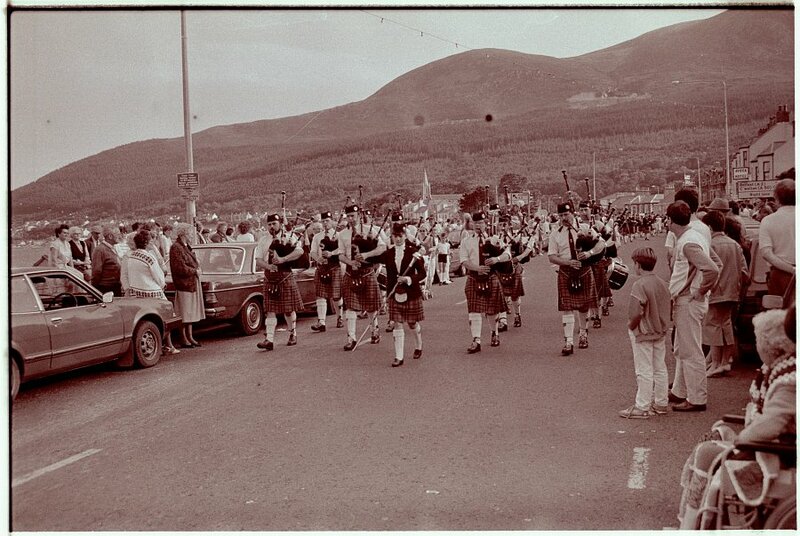 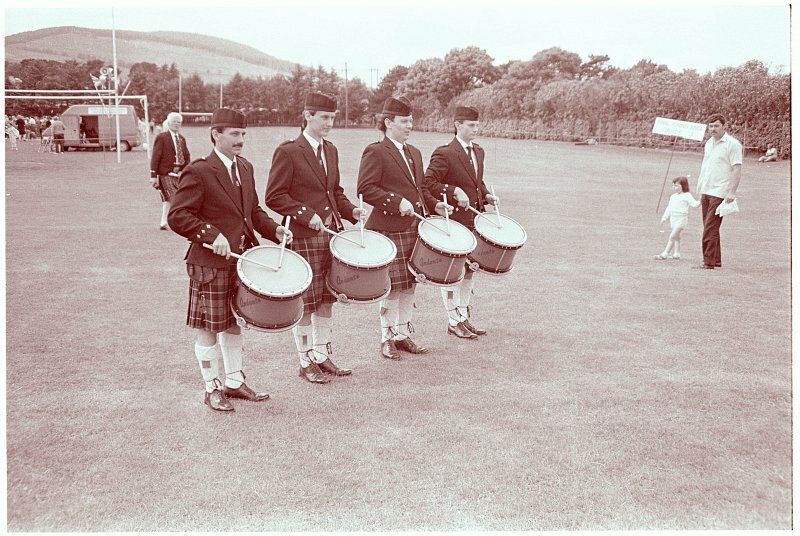 Banbridge Pipe Band in the early 80's with one of the very first sets of Andante Drums. 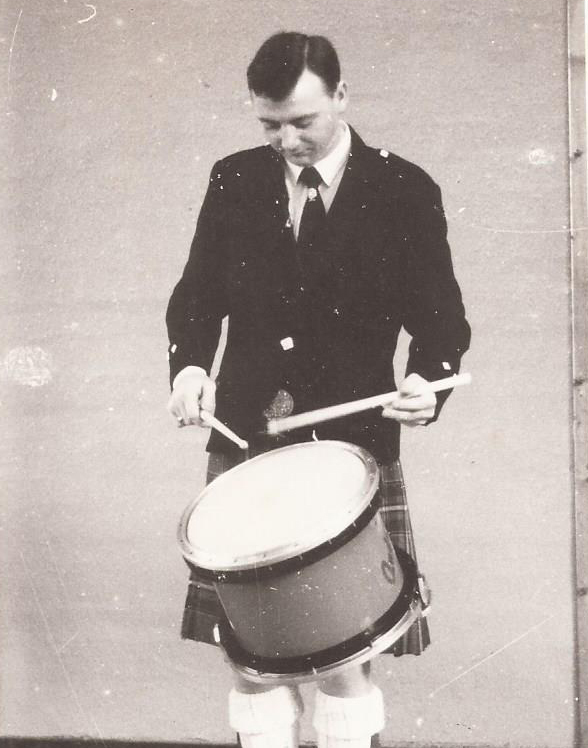 Scottish Power Leading Drummer John Scullion playing the Andante Prototype Snare Drum at the World Solo's 1986. 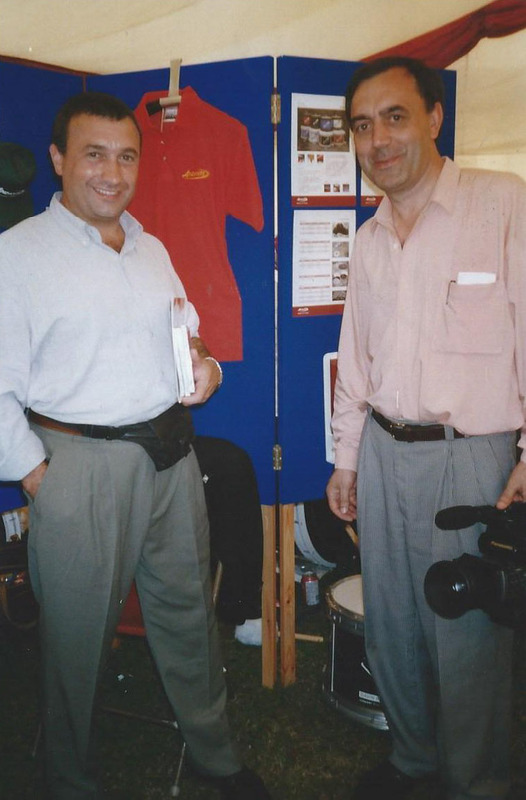 Sam on one of his many visits to France with the latest Andante Snare Drum of it's time, the SPA30 in the late 80's. 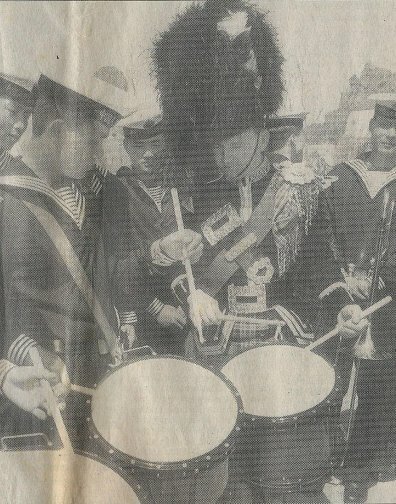 Field Marshal Montgomery Drum Corps with Leading Drummer Gordon Parkes first on left, performing with the latest DTS4 Andante Snare Drum, during the early 90's. 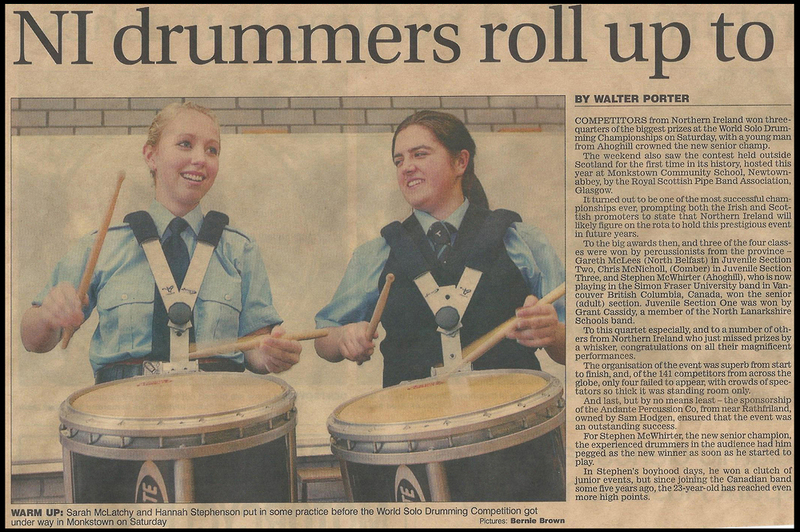 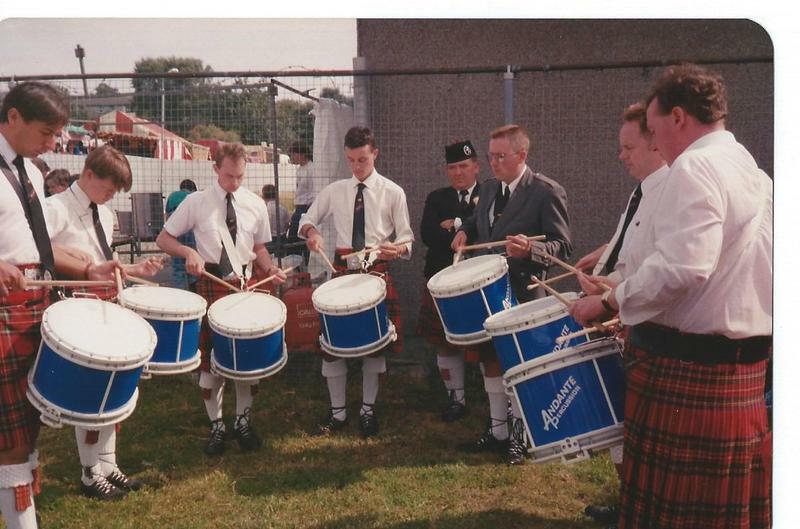 78th Fraser Highlander Drum Corps performing with their new DTS6 Andante Snare Drums, with Leading Drummer Harvey Dawson fifth in from right, during the mid 90's. 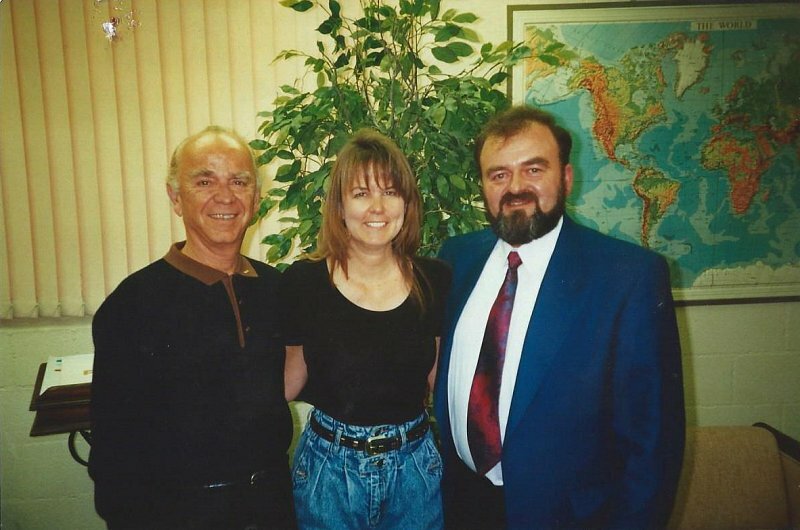 Remo Belli on left, Founder of Remo Inc, Carol Carpentar middle with Sam Hodgen on right during Sam's visit to USA in 1995. 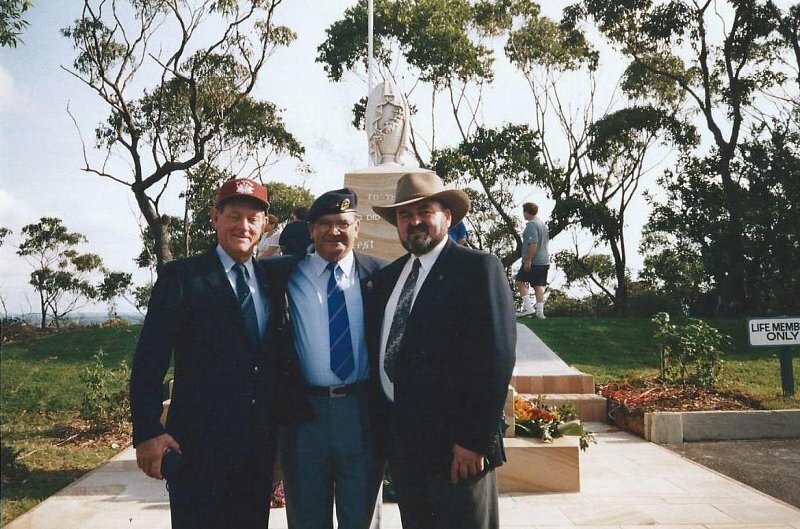 Sam on right, on one of his visits to Australia, with good friend John McFarland in the middle, the first Andante Agent in Australia. 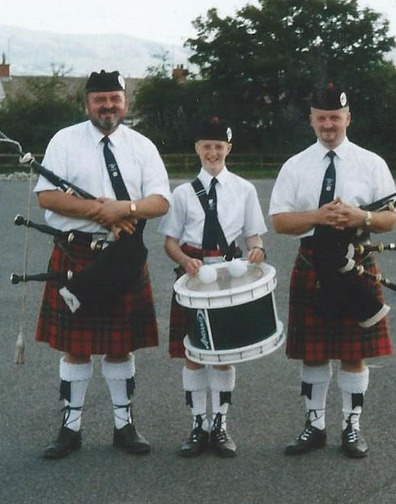 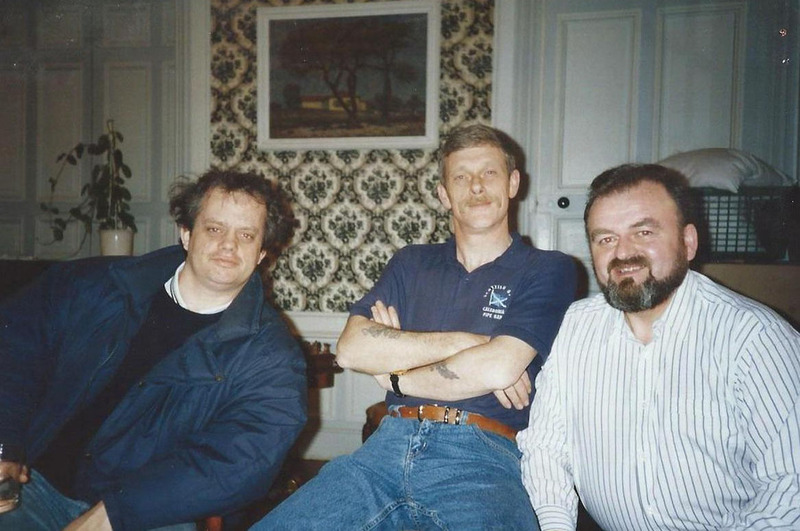 Nigel Hodgen, George Ussher & Sam Hodgen at the World Solo Drumming Championships held in Bathgate, Scotland in 1999 Sponsored by Andante and is still sponsored by them today. 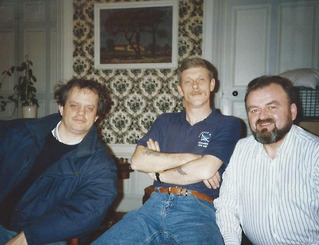 Arthur Cook, Lee Lawson with Sam at the launch of the New Reactor Snare Drum in 2000. 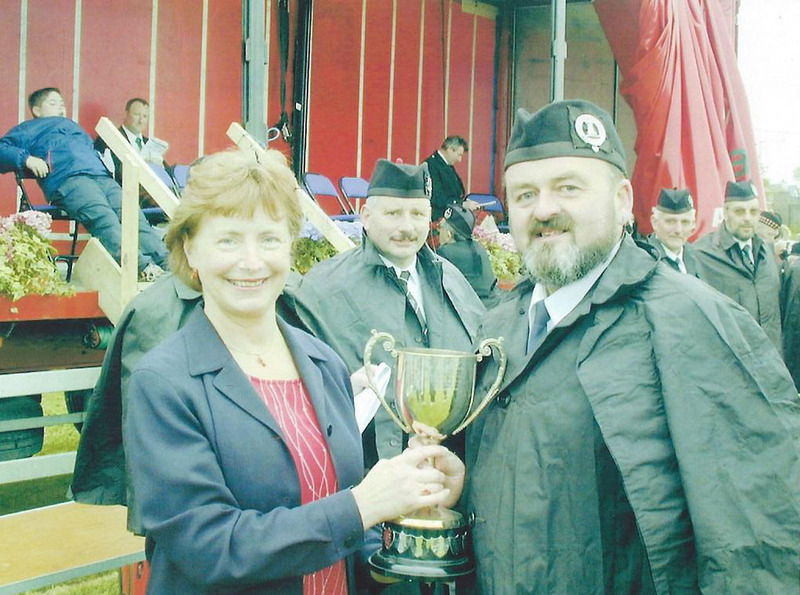 Gordon Brown Director of TG Drumming & Leading Drummer of Boghall & Bathgate Caledonia PB Grade 1, being presented with the winning Drumming Sash in June 2007 at the British Championships. 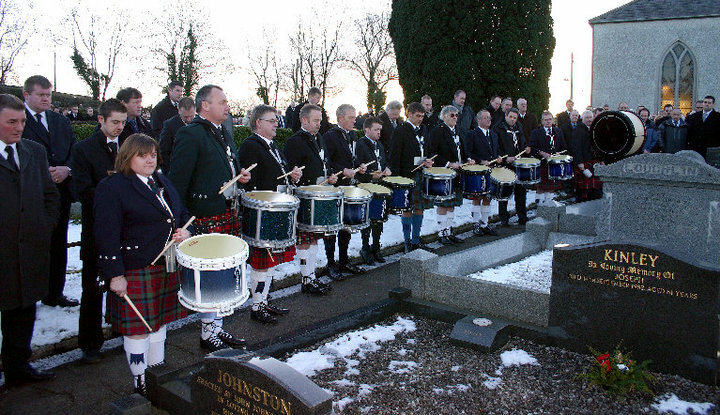 A Drum Salute under the direction of Gordon Brown was given at the graveside and 12 of the most famous Drummers in the world played as a respect to Sam. 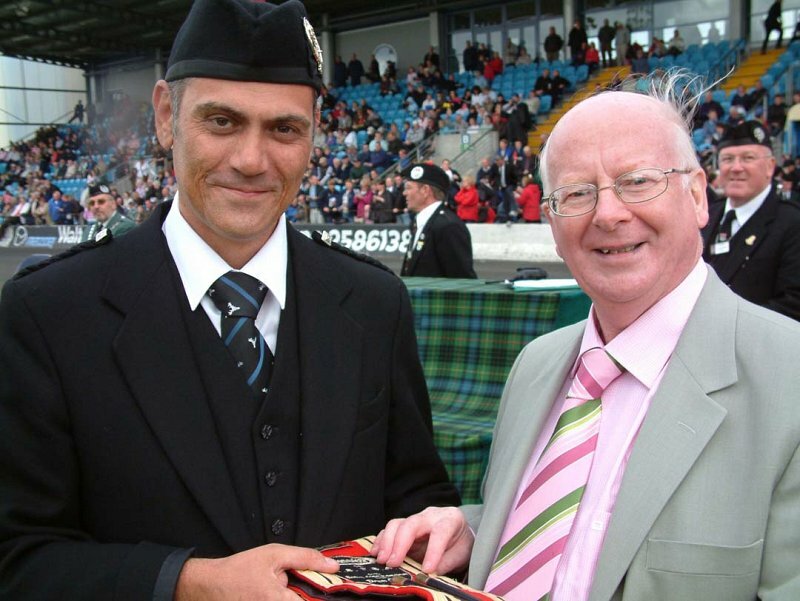 The players were deeply honoured to have been asked to do this in memory of their dear friend. 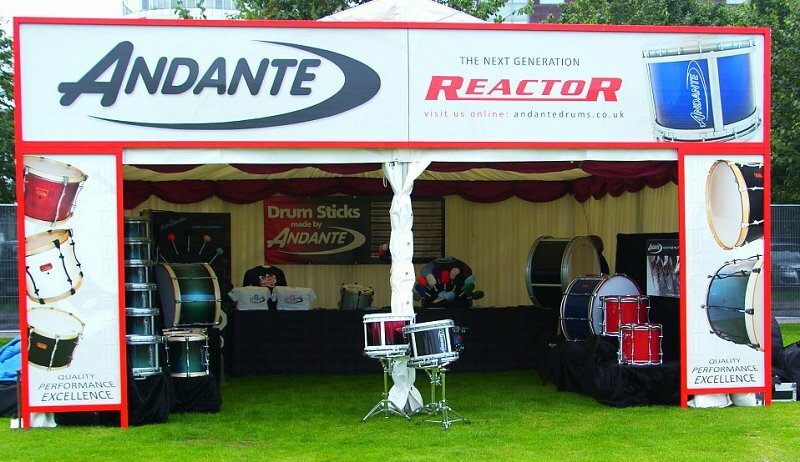 'Andante' exhibit at the 'Worlds Pipe Band Championships', held in Glasgow every August, showcasing all the Andante product ranges. 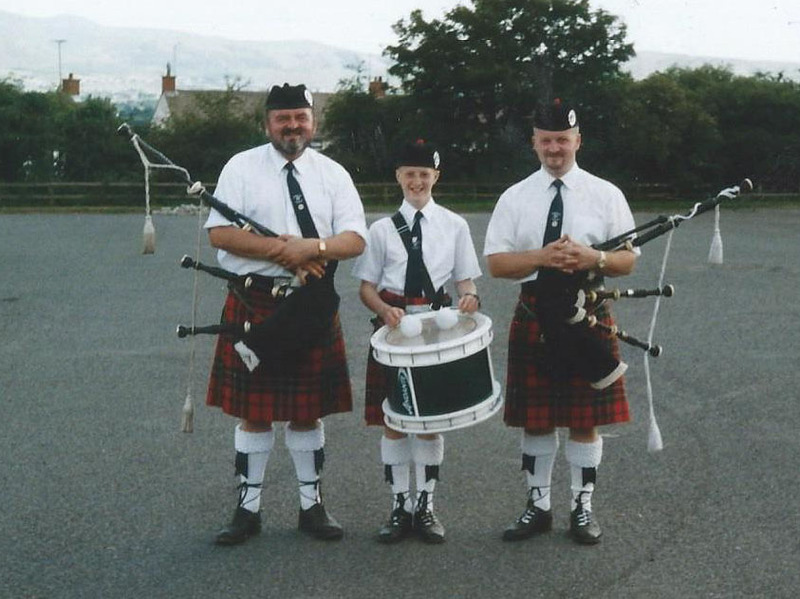 SFU Drum Corps with Lead Drummer Reid Maxwell middle, along with Nigel Hodgen on left and Adrian Hodgen on right, before SFU's performance at the Lincoln Center on 4th May 2012. 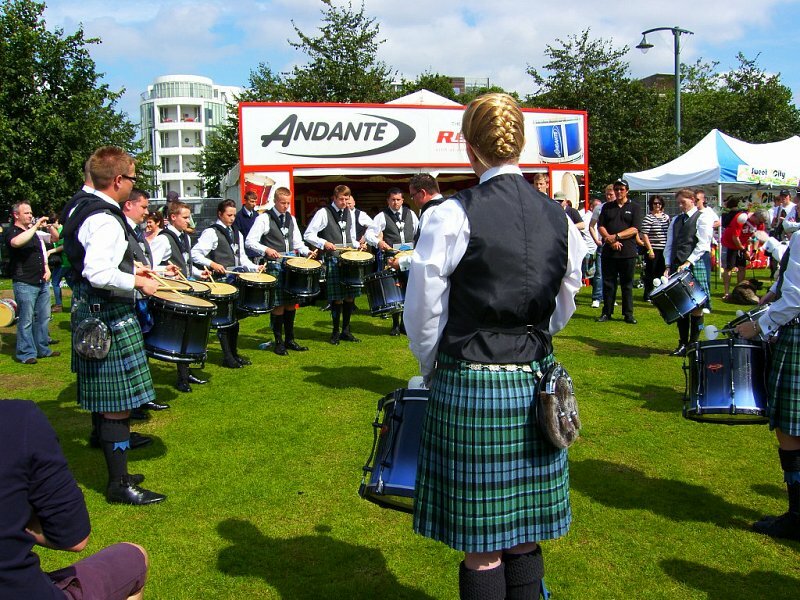 Inverary & District Drum Corps with Lead Drummer Steven McWhirter, outside the 'Andante Exhibit' at the World Pipe Band Championships, Glasgow in August 2012. 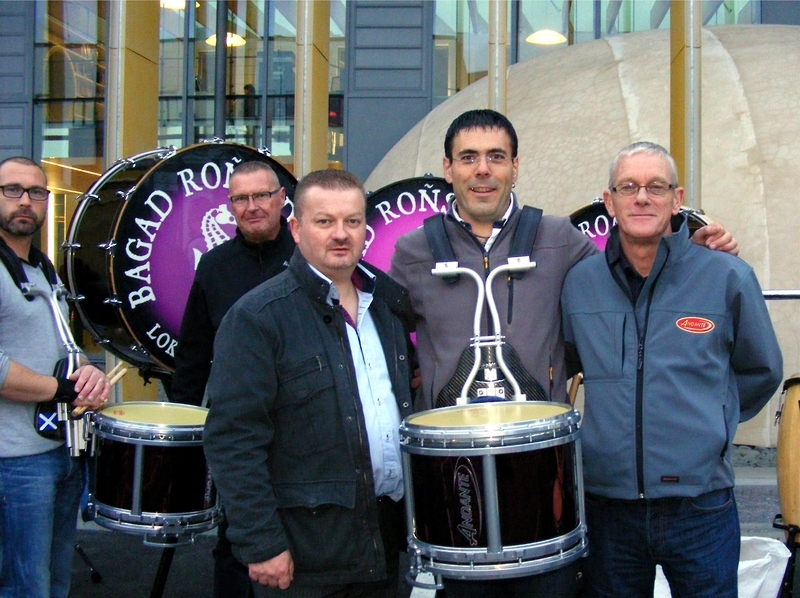 Nigel Hodgen from Andante on left, with Lead Drummer Iwan Kalv-s of Bagad Ronsedmor Locoal Mendon, Brittany in the middle, along with good friend John Moneagle on right at the Pontivy Solo's. 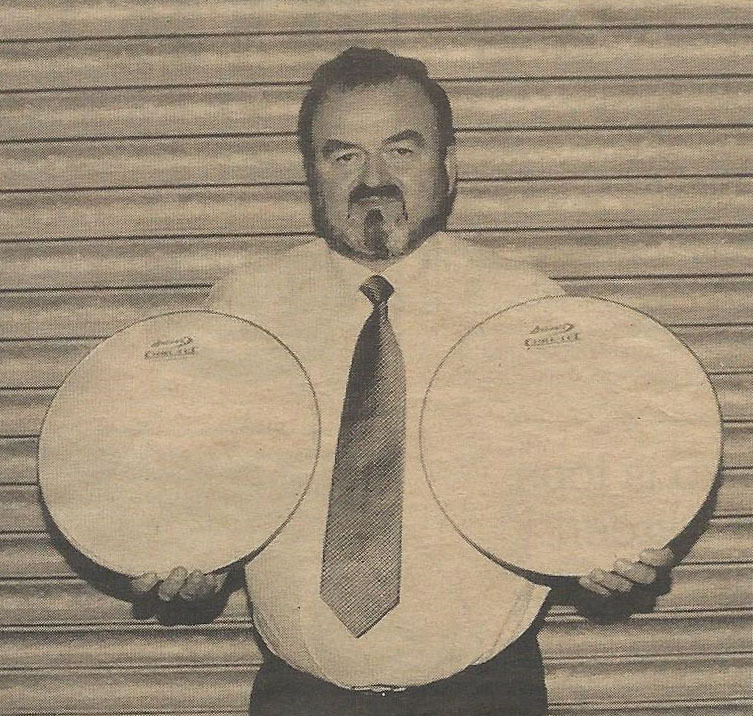 Follow the pictures of this remarkable story of one man's journey through high's and low's of becoming the most iconic Drum Manufacturer in the world today, known as Andante Percussion (Founder Sam Hodgen). 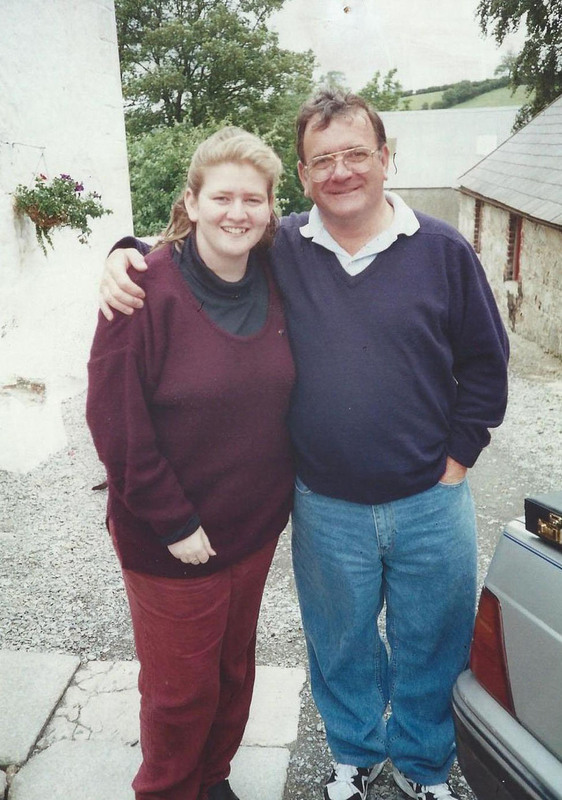 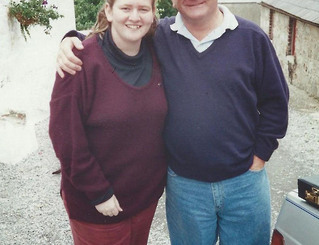 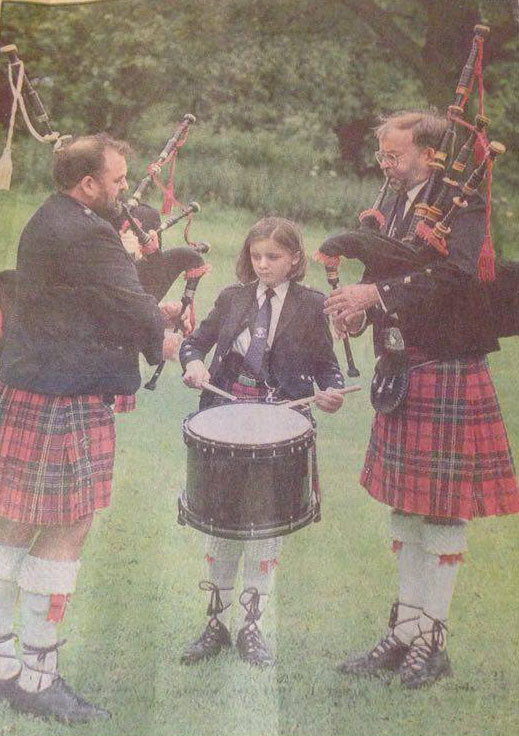 Today Andante lives on and is driven by son Nigel, daughters Sandra & Heather and nephew Adrian, who all grew up with pipes & drums as a huge part of their lives and who have been alongside Sam on his journey for many years.